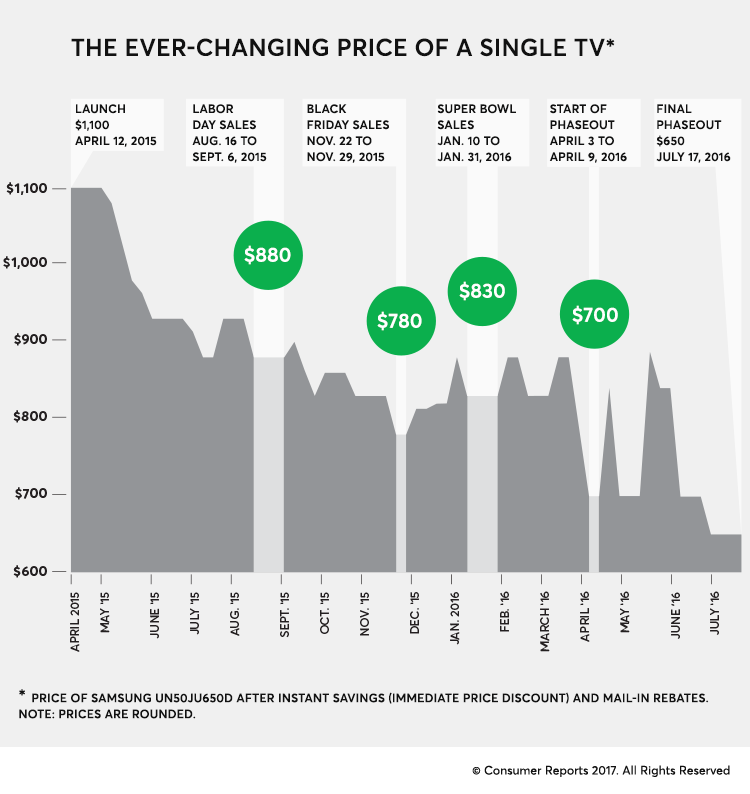 When is the Right Time to Buy a TV? In life whether youa’re looking to get married, need a job change, or planning to buy a TV timing is everything and while we cannot advise you for the first two instances, making sure you get the best deal on your TV is our forte. So here are some of the best times throughout the year to buy your new TV. Black Friday is indeed a good day to buy a new television. The Black Friday sales take place the day after Thanksgiving. Amazon’s usually the place to be but isn’t alone. Close in behind are Walmart, BestBuy and other online retailers. As you can see from the graph below, Black Friday discounts are significant, and prices tend to rise up to January 1st. Black Friday prices are better than SuperBowl sales. Yup, you can find other discounted appliances too such as Dishwashers, washing machines etc. but TV’s tend to be the popular choice amongst buyers and according to data on Consumer Reports you can grab them for as low as half the price. Competition is stiff on this day with prices being increased/decreased in real time so you’d want to stay glued till you get a deal that best fits your needs and budget. Also, a few brands manufacture Black Friday special TV’s and while they are usually the cheapest their functionality is below par (not a deal we’d recommend until it’s the only choice). Missed the Black Friday Sales? The Super Bowl week is your next best bet. The super bowl week goes toe to toe with black Friday with an average discount of 22% reported by Consumer Reports. The super bowl sales start in January and continue into February with 49-inch and 65-inch TV sets being the most popular buys, after all, who doesn’t want to watch the biggest game of the year on the big screen, right? Another reason discount rates are high during this time of the year is because new stock is bound to come in and getting rid of the old ones becomes a priority (more in detail about this below). 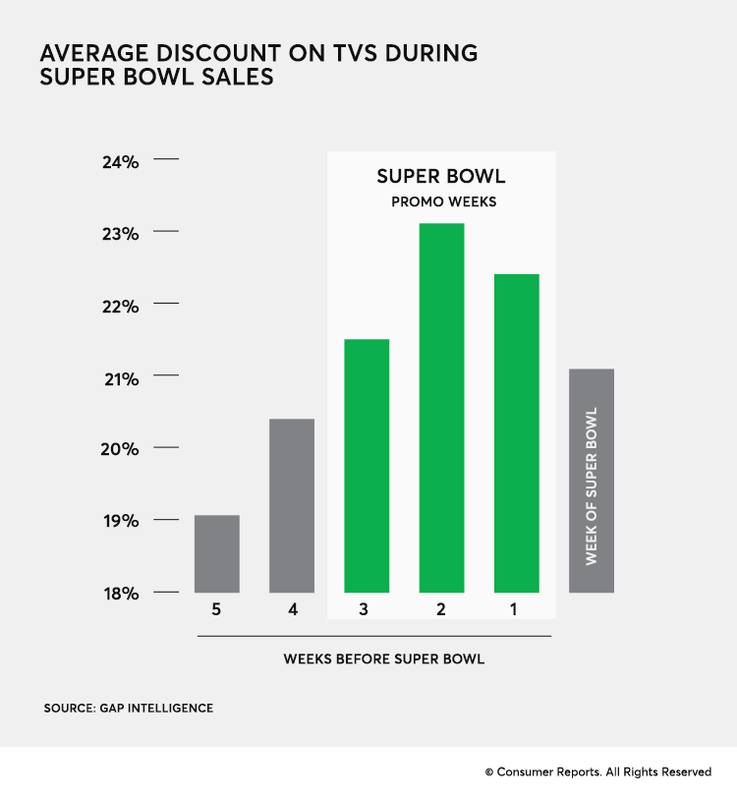 While discounts for the year-end start around the super bowl they hit an all-time high in the month of March. Yup, it’s not the deal you could score during black Friday sales or super bowl week but if you’re not willing to wait, here’s your chance. Spring is the season of rebirth, renewal etc. and that’s why new stock fills up the stores and the old TV sets are up for grabs at cheaper prices but you’ll likely miss out on the latest features and updates. If you have a specific make or model in mind a refurbished version can be bought at a much cheaper price. Refurbished models are those that have been sent back to the manufacturer for repairs. So isn’t buying a repaired TV a gamble? Not so if the TV has a full warranty. Have you ever returned any electronic back to the store? Well, these returned TV sets and appliances are sold back but at a discount. In case the store you’re at doesn’t have an open-box section be bold and ask about it. Also, if there are no promotional boards etc. about an ongoing discount you can ask the salesperson upfront for a discount on the displayed models. Buying a used TV isn’t as bad as it sounds and more often than not may prove to be a bargain (a gamble worth taking). Scoring the perfect deal might sound tough but with thorough research about the brand and model and existing prices, it’s not too difficult. Craigslist and local newspapers are the ideal places to check out for listings. Have a store in mind? A gift card can prove a good helping hand. For gift cards check out Gift Card Granny or Gift Card Mall. These cards can help save an extra 10%-15% on top of any promotional scheme currently run by the store. Visit a Local Store: Yes, we understand the allure to hit that buy button while checking out TV’s online but hang on, don’t do it just yet. The pictures online are edited to look perfect, nothing like checking out the resolution and size with your own eyes. So make sure you visit a nearby store to get more details about any make or model you like. Keep an eye on social media activities: Following brands on social media has its own perks. Most often it is through their Twitter, Facebook etc. pages that discounts are announced and who knows if you’re lucky enough you might just win a giveaway or discount coupon. Research: Whether you’re buying a TV, washing machine etc. it all comes down to good research. It’s true most online retailers encourage users to shop during the holiday season or super bowl but if you’re in need of a TV now do check out the Deal for Day or Special Discount sections on sites like Amazon, Walmart etc. Say no to extended warranties: The salesperson will make you believe that an extended warranty is a must, don’t fall for it as it can be costly. Rather make your purchase using a credit card or from a brand or store that automatically extends the warranty after a year or two. Avoid additional purchases: So while at the store you also decide to go for the additional HDMI cable or the Bluetooth headphones but if you’d ask us, leave those purchases for your online shopping spree as you’re likely to get them cheaper there.